The OMB-DBK8 provides eight high-impedance, high-voltage input channels for OMEGA’s OMB-LOGBOOK and OMB-DAQBOARD-2000 Series data acquisition systems. The OMB-DBK8 accommodates 10, 50, or 100 VFS bipolar inputs that you can set on a per-channel basis via jumpers on the card. The OMB-DBK8’s 10 M .input impedance presents minimal loading of high impedance circuits and transducers ( e.g., string pots), which ensures accurate readings over a wide range of source impedance, and high impedance transducers, such as string pots. Each of the OMB-DBK8’s inputs provides an individual buffer amplifier that allows the combination of high-speed (10 µs/reading) and high-input impedances. 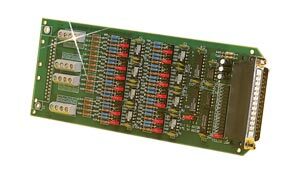 As many as thirty-two OMB-DBK8 cards can be used in one system, for a total of 256 high-voltage differential inputs.